Film Review: "Exodus: Gods and Kings"
Christian Bale stars as Moses in Ridley Scott’s latest epic. I’m so glad I watched Ridley Scott’s latest epic Exodus: Gods and Kings by streaming it on iTunes, because it took me three days to get through this two and a half hour movie, and the freedom of a movie in the cloud meant I didn’t have to bring the Blu-ray with me between work and home (and considering that I don’t have a Blu-ray player at work and can only stream… well, you understand). 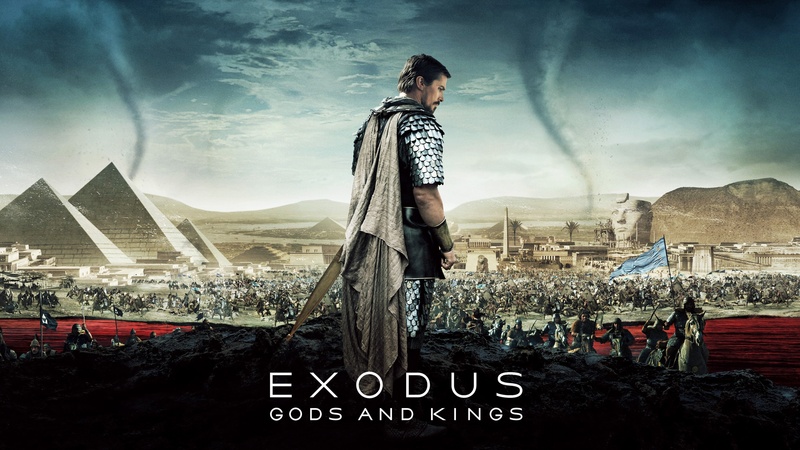 Exodus: Gods and Kings tells the story of the adult Moses, a Hebrew raised amongst Egyptian royalty, unaware that he is the chosen one to lead his enslaved people out of Egypt and into the promised land of Canaan. The film begins by establishing the loving, yet competitive relationship between Moses (Christian Bale) and his adopted brother, Ramses (Joel Edgerton). The latter is in line to take the throne once their father, the Pharaoh Seti (a reserved John Turturo), dies. Moses is sent to meet with a viceroy in the city of Pithom and is abhorred by the terrible way the Hebrew slaves are treated. He tours the city and meets Nun (Ben Kingsley), who explains to Moses his true identity. As an infant he was placed in a basket and floated down the river so that he wouldn’t be murdered at a time when all of the first born Hebrews were ordered killed by the Pharaoh. Moses was discovered by Pharoah’s daughter and raised in royalty. The old man reveals that God has greater plans for Moses. Upon his return home, Seti passes away and Ramses takes the thrown. He proves that he’s more concerned with his legacy than taking care of the people under his rule. Of course, most of the people are Hebrews who’ve been enslaved for over 400 years. They built the pyramids, statues and temples and believe that a time will come when God will help them rise up and return to Canaan. Two Hebrew slaves reveal that they know that Moses is a Hebrew and Ramses is faced with a dilemma. Does he kill his own brother, or does he offer him a chance to flee Egypt and try to survive in the cruel desert. Ramses chooses the latter and expels Moses from Egypt. Moses is too great a warrior to let assassins or the desert take his life. He comes upon a small village and falls in with them, never revealing his true identity. He becomes a shepherd, marries a God fearing woman named Zipporah (Maria Valverde) and they have a son. Nine years pass and Moses, while trying to rescue a stray lamb, is confronted by the burning bush and God in the form of an angry British boy. God instructs Moses to become his general in leading a revolt against the Egyptians and Ramses until the Hebrews are freed. Thus begins war between Hebrew rebels and the Egyptians. In a montage that could come from just about any war movie, Moses trains the rebels how to shoot a bow and arrows, how to ride horses and shoot a bow and arrows, and hand to hand combat with a bow and arrows. Somehow he does this all under the nose of the Royal Guard. That part didn’t really make sense to me. I’m not giving anything away when I say that Moses wins and the Hebrews are freed. A thousand years of storytelling are on my side with that one. This secular take on the Book of Exodus is a conflicted film. On the one hand, it’s a massive movie full of bloody battles, devastating plaques (thanks to special effects), tidal waves and thousands of CG people. If this had just been a war movie and a film about the Hebrews fleeing Egypt, it might have been a great film. On the other hand, it also tries to be an introspective tale of Moses coming to terms with his birthright and wrestling with God. Moses’ tale is a great one, even if you aren’t religious. Bale does a remarkable job capturing the man’s struggles. As for his spiritual journey, well, that gets the short shift in favor of time spent with Ramses and the many baffled looks Edgerton delivers. The amount of time spent with Ramses skulking in the shadows or listening to his inner counsel give long speeches of exposition is the biggest flaw of Exodus: God and Kings. He just isn’t that interesting of a character (at least in this film) and a good half hour of the movie could have been trimmed to allow the story to focus squarely on Moses and his coming to terms with what God is expecting him to do. Bale does an admirable job playing Moses, and Edgerton is fine. He’s an exceptional actor, but he’s kind of wasted in this movie. Equally wasted is Aaron Paul, who does a lot of standing around a gawking. Sigourney Weaver also appears, albeit in a very small role (that also requires a lot of looking on). There are some truly great moments in the film. The parting of the Red Sea is spectacular and I can only imagine how magnificent that appeared on the big screen. However, I truly hoped to be inspired by Exodus and instead I came away feeling “Meh.” It’s not that there aren’t powerful moments in the film, beautifully quiet scenes with wonderful dialogue (from a script credited to Adam Cooper, Bill Collage, Jeffrey Caine and Steve Zaillan). However, the bombast and spectacle blow these scenes away, leading me to believe that Scott either didn’t know when to pull back or didn’t trust himself to let the message of the story carry the film. Moses wasn’t the only one struggling in this film. As I said, Exodus: Gods and Kings is available for digital download through the usual sources. It is also available on Blu-ray. That physical copy of the film includes featurettes on the historical background of Moses, Deletes and Extended scenes (which surprised me because it seems like nothing was cut) and running commentary by Ridley Scott and Co-Screenwriter Jeffrey Caine.